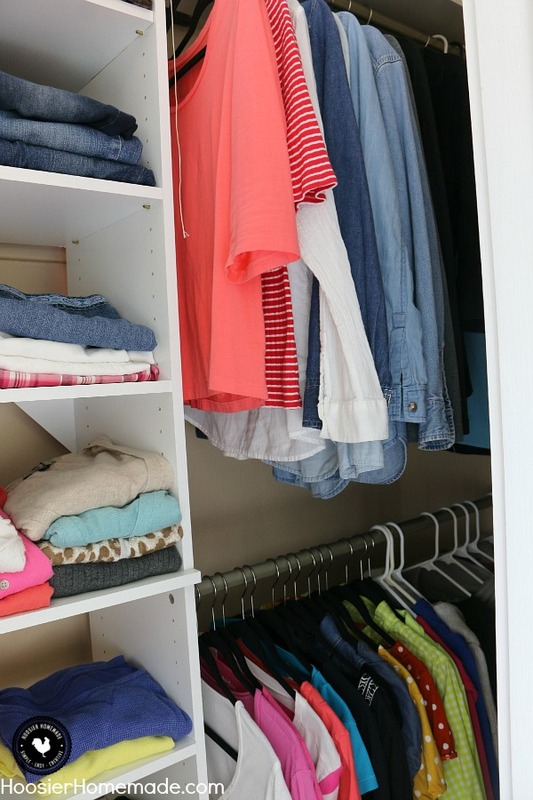 Is your closet unruly? Are you overwhelmed? Well if you said yes, then you are in luck. 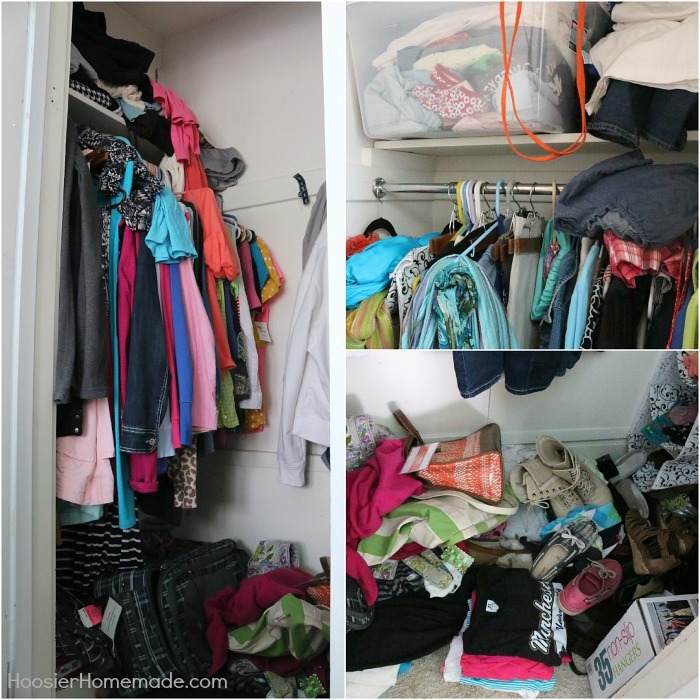 Today I have some tips on organizing a closet. And let’s just say, the before pictures might just shock you. Over the last couple of months, we have been working on redecorating and organizing our bedroom. 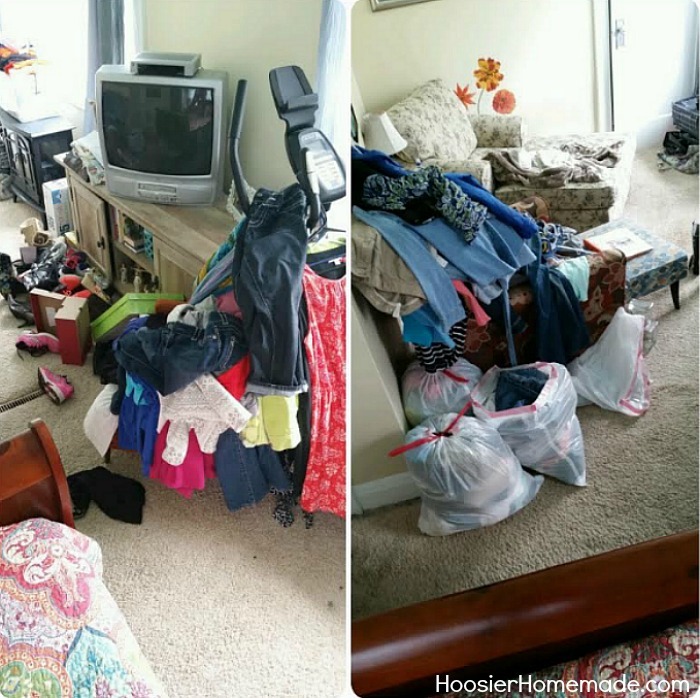 We began with ugly walls that needed some repair and painting, we added some new furniture and bedding. 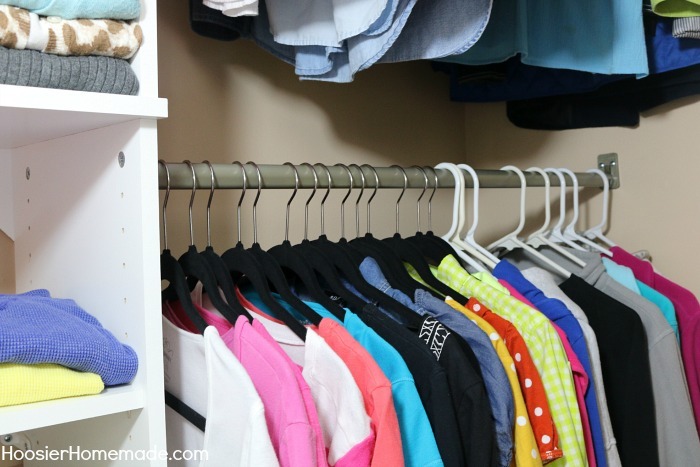 Today, we are taking you through the process of organizing our closets. 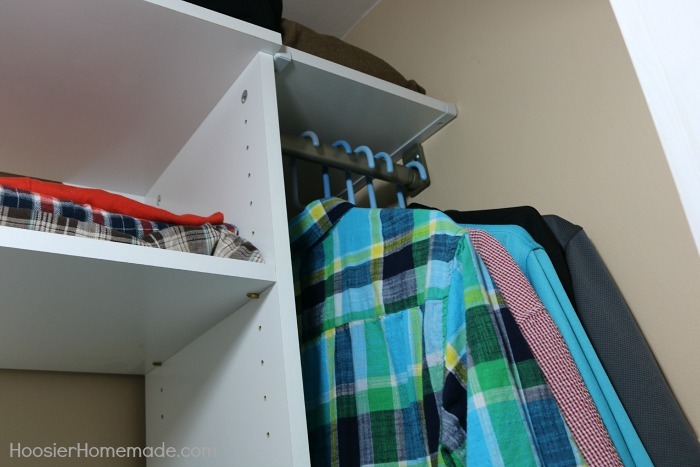 We are sharing the mess we began with – and OH the mess that it was, how we decluttered and got rid of 12 big bags of clothes, and finally how we tore out the old shelving and rods, and replaced it with an amazing closet organizing system. Let’s get right to it. While I once considered myself a very organized person, over the last 3 years, I have been so busy, I haven’t had time to keep up. Can you relate? Not only was time, or the lack of, an issue, there was also an issue of simply having too much stuff. While I love to have clothes to choose from, I have learned that I just don’t need that many. Simplifying our lives is a top priority this year. So, as you can see, we had quite the mess – organized chaos, perhaps. The first step was to take everything out of my closet. (We will get to Doug’s closet in a minute) If you follow me on Instagram, you may have seen the mess we had going for a few days. 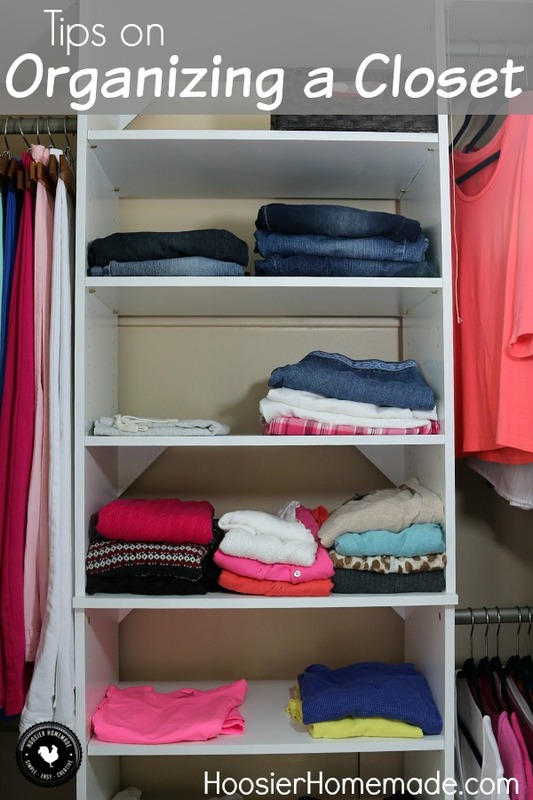 Clothes were divided into piles – 1) clothes to keep, 2) clothes to try on, 3) clothes to make a decision about and 4) clothes to get rid of. Then each pile was divided into hanging clothes and folding clothes. And the bags were taken to the basement to later take to Goodwill. Then it was time to tackle the inside of the closet. 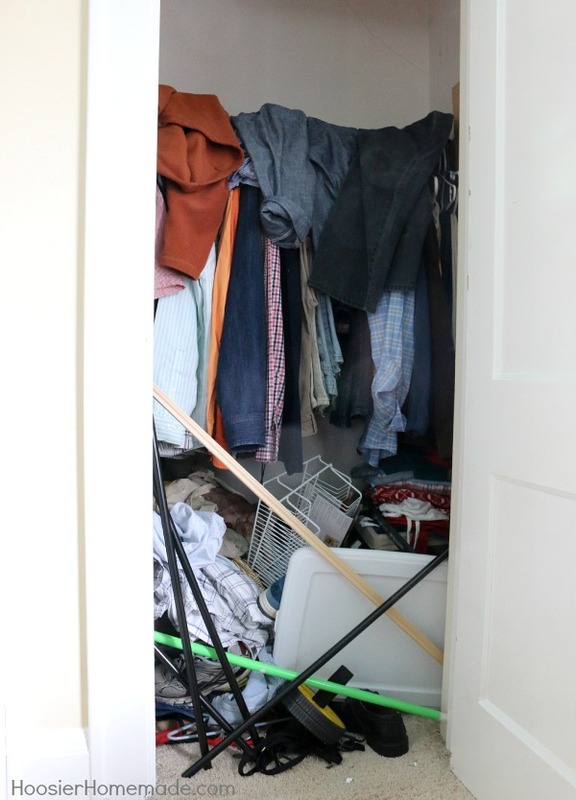 Not only was there a mess from too many clothes and accessories, the walls were in desperate need of repair and painting. Doug took out the shelves and rods, scraped the old paint, sanded and repainted. 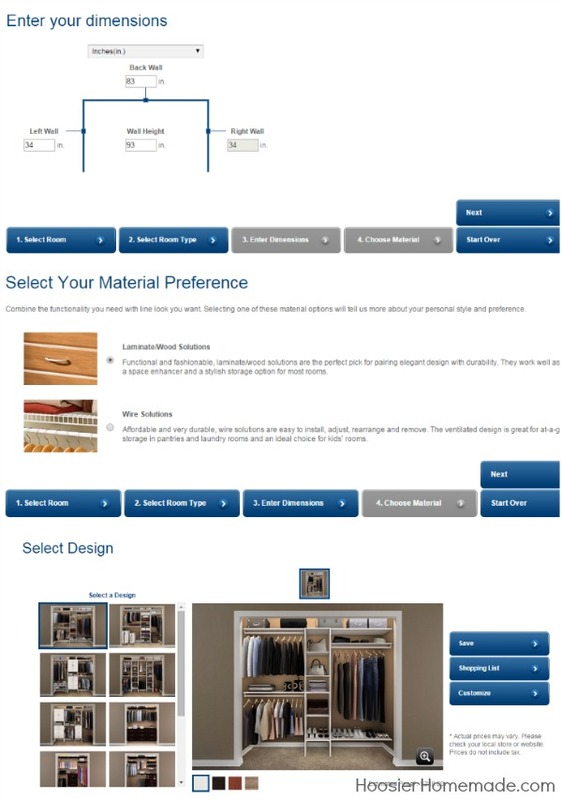 Then with the help of the ClosetMaid Design Tool, we were ready to select our new closet organizing system. This was the part that I kind of dreaded. 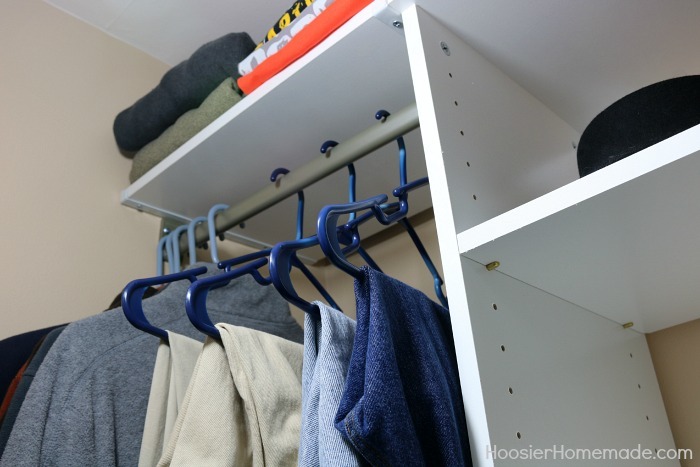 Over the last year or so, we had been looking at closet organizing systems at local hardware stores and it just seemed a bit overwhelming. We were excited that the Design Tool took us through step-by-step, and it was super easy to use. First we measured the walls (left and right), the back wall and the height. Then entered those figures into the system. Next we chose what type of shelving we wanted, we chose laminate wood. And then a lot of systems were offered. We simply scrolled through and chose one that we liked. I’d say in about 10 minutes, we were done figuring it all out. 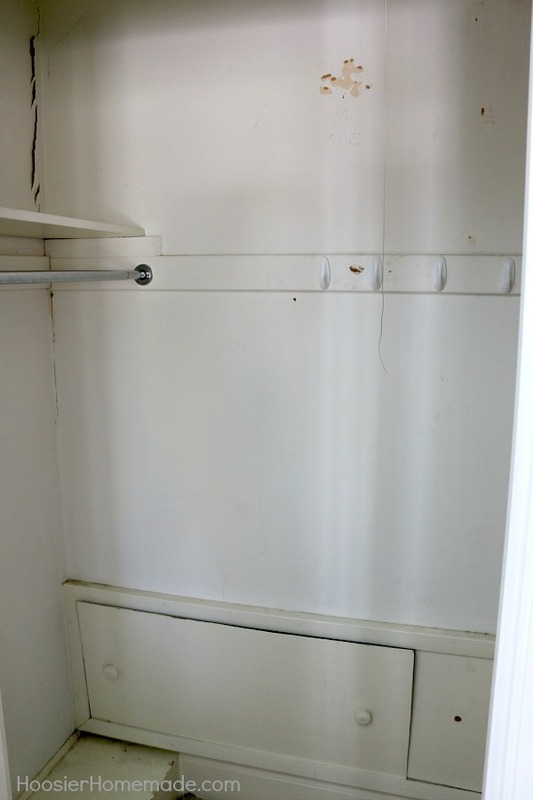 After the closet system arrived, it was time to begin installing it. 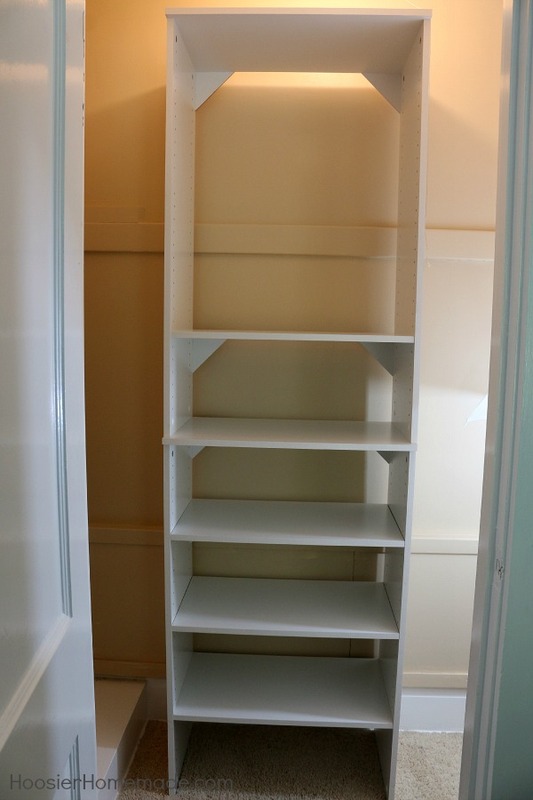 We chose the ClosetMaid SuiteSymphony™ 25″ Starter Kit in Pure White. I love the clean look of it, and it was super easy to install. The directions were easy to follow and we had the closet systems in place in about 3 hours, each. Remember the piles that I separated into folding and hanging? Now it was time to get them organized. 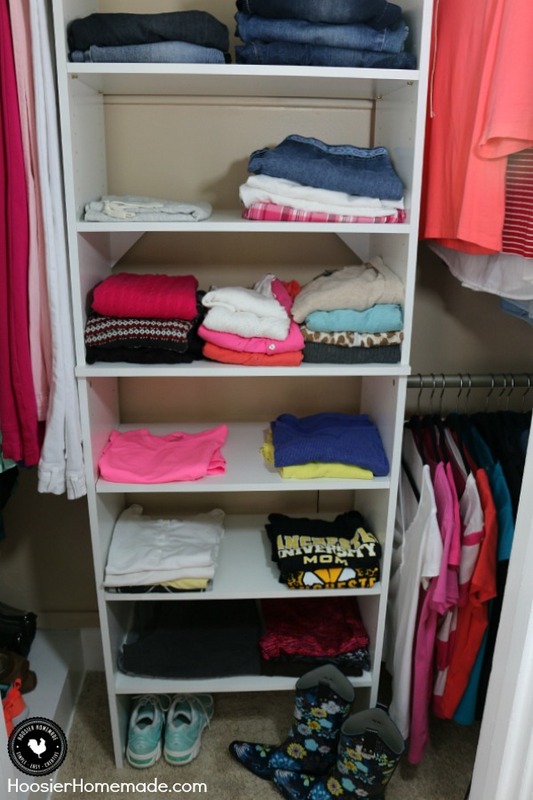 The middle section holds all folded clothes. Then on the right side there are 2 rods for hanging shirts. I still need to get some more hangers, but one step at a time. And the rod for long hanging dresses and pants on the left. We also tackled Doug’s closet. Like me, he had way too many clothes. So we used the same sorting process and got rid of a lot of his clothes. This is the crazy mess he had going on. I guess I don’t have any room to talk, but holy cow. He even had a piece of wood and a broom holding everything in there. Crazy, isn’t it? Doug’s closet set up is similar to mine, just a little smaller. Shirts are hung on the bottom. 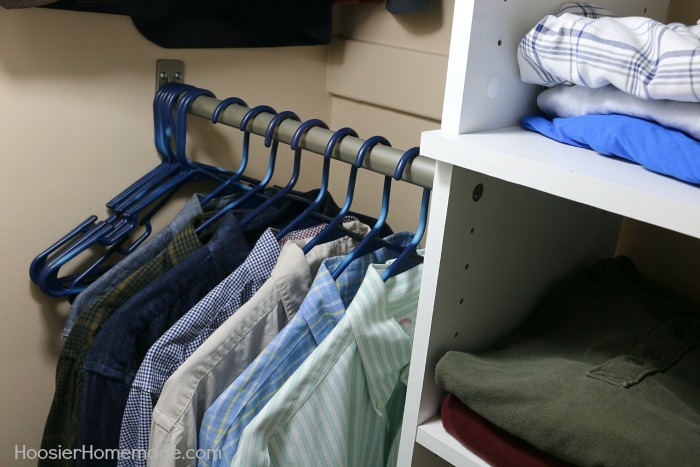 See how he turned his hangers backwards? That’s a little tip so you know what you have worn, if you don’t wear it within a year, time to donate it. I guess I need to do that too. Then jeans and sweatshirts above the shirts. And more space for shirts. 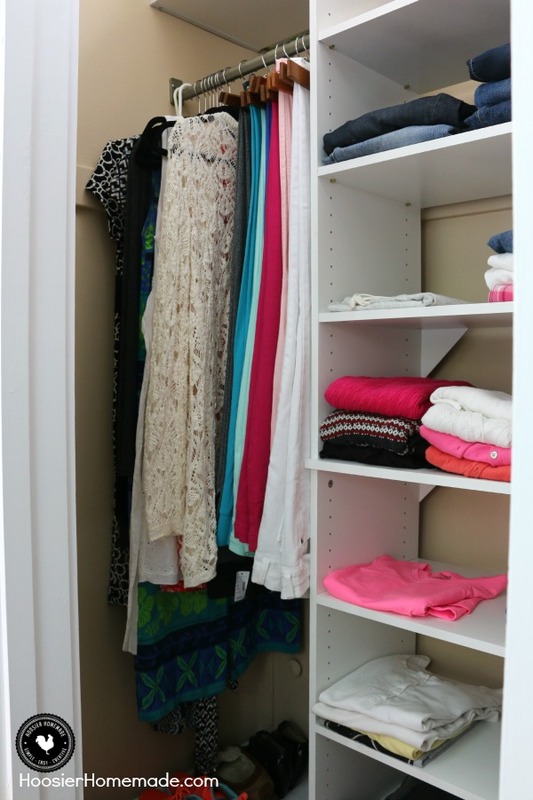 I hope we have inspired you to get your closet organized! 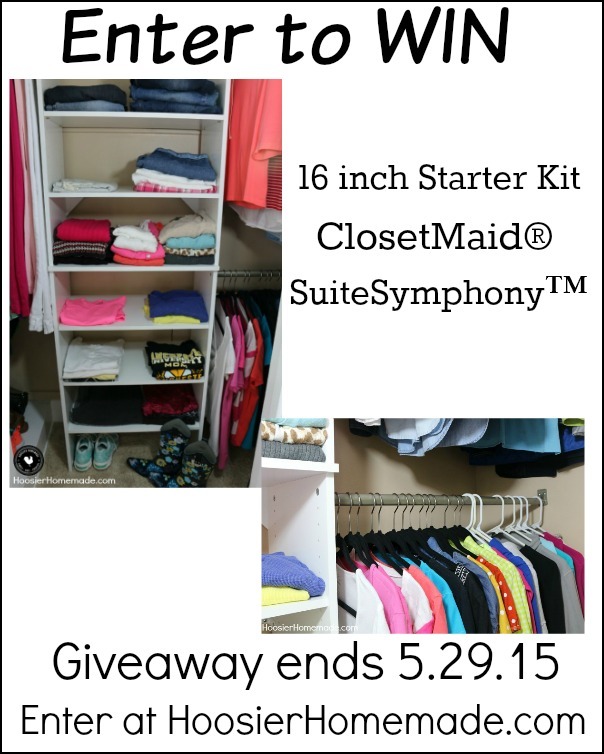 Now it’s your turn – head on over to enter to win a ClosetMaid® SuiteSymphony™ 16″ Starter Kit in Pure White. And, don’t forget to share your pictures with me on Facebook or Instagram. Use hashtag #InspiredbyHH – show me the good – the bad – the ugly – I want to see them all! This is a sponsored conversation written by me on behalf of ClosetMaid via Burst Media. The opinions and text are all mine. Great tips, now if I removed all the clothes that don’t fit there would probably be only half of a closet full, thanks. Going through clothes can seem like such an overwhelming task. I like how you broke it down so it seems more manageable. Thanks for the tips! 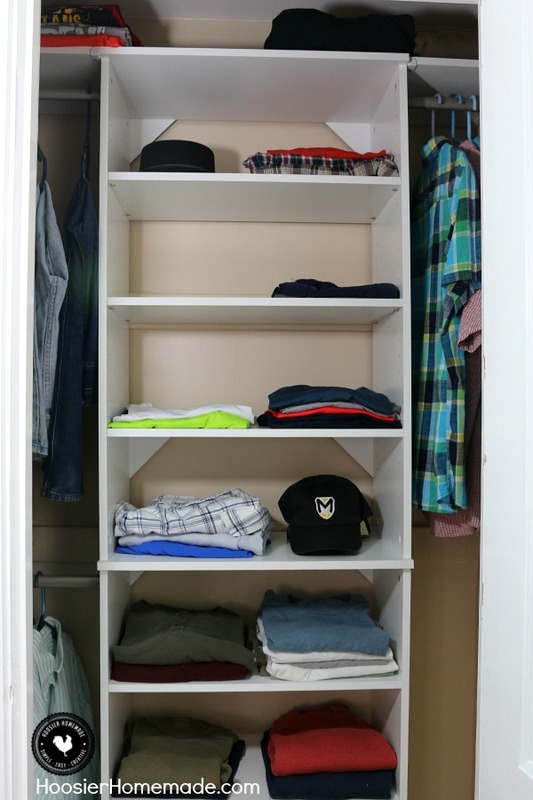 Your closets look great! Thanks Beckie! It’s hard to give up clothes some times, but it’s really worth it in the end. Right? I need to completely overhaul my closet as well, and I am dredding it. But being able to win this organizer might help! !